The capital of Poland, Warsaw (Warszawa), has some 1.7 million inhabitants. 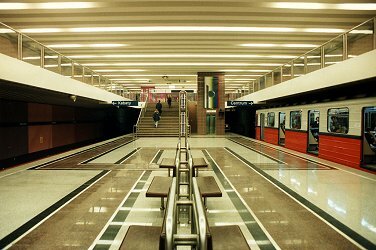 Whereas most cities with more than a million inhabitants in Eastern Europe built a metro under communist regimes, Warsaw (and Sofia) did not open its first line until democracy came to Poland, although plans for a 4-line network, which should eventually have more than 100 km, had been designed some time ago. 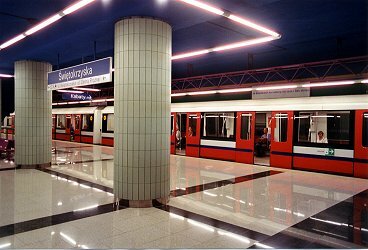 Line 1 opened in April 1995 between its southern terminus Kabaty and Politechnika (11.5 km, all underground). 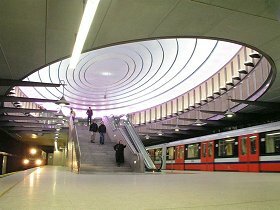 On 26 May 1998 Centrum station was inaugurated as the largest station on the line, situated just north of an east-west railway tunnel built in the 1930's and close to the city's main railway station. Between Politechnika and Centrum another station called Plac Konstytucji was planned and might be built later to provide transfer to the future Line 3. 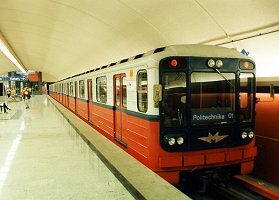 An extension towards the north with two stations opened on 11 May 2001 - Świętokrzyska (future transfer to Line 2) and Ratusz (1.7 km). Initially Russian-built rolling stock (60 cars of 81-series, identical to those operating in Moscow, Prague, St. Petersburg, etc.) was bought, but in spring 1998 more than 108 new cars were ordered from GEC Alsthom. The first new cars were delivered in Oct. 2000. 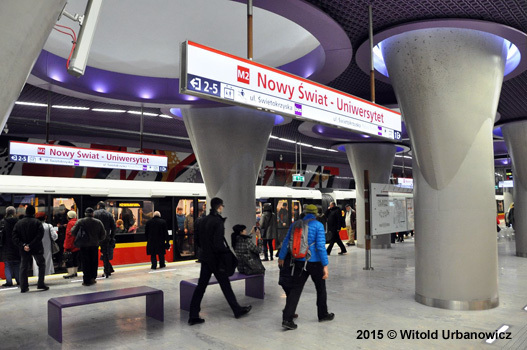 The first section of the first metro line, from Kabaty to Wilanowska was built by the cut-and-cover method, the so-called Berlin Method. The section through the city centre was built using a tunnel boring machine for two 5.5m single-track tunnels. Gradually the line was extended further north, in 2003 to Dworzec Gdański, in 2005 to Plac Wilsona, in 2006 to Marymont and in 2008 to Słodowiec. 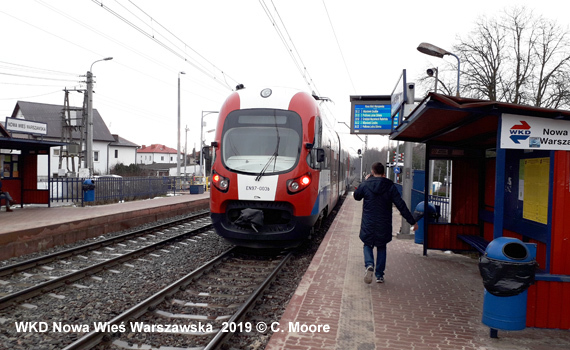 Eventually it reached Młociny in the north of the city in Oct 2008, with two intermediate stations: Stare Bielany, Wawrzyszew and Młociny. The last 4 stations were built with 4.5 m wide side platforms. Tunnels along the northern section were realised by the cut-and-cover method. 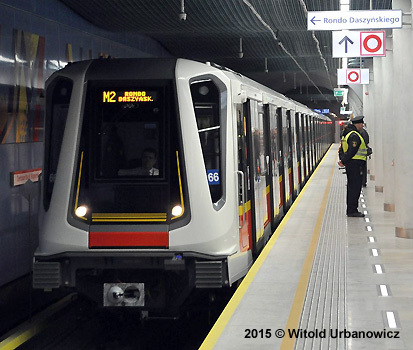 The terminus Młociny is a major interchange hub, with facilities for park and ride, transfer to existing tram and bus lines, as well as a new 'fast tram' which will cross the river along a new bridge to the Tarchomin district. 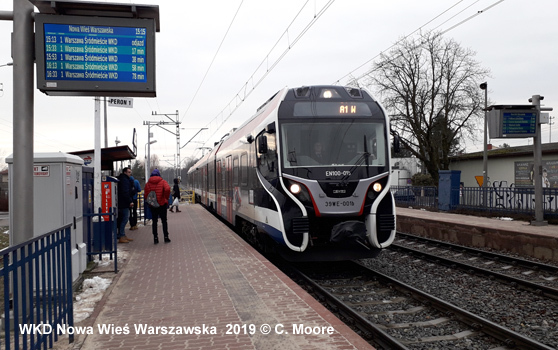 Initially two more stations, Plac Konstytucji (between Politechnika and Centrum), and Muranów (between Ratusz and Dworzec Gdański) were planned but shelved for financial reasons. The current length of the line is 22.6 km with 21 stations (10/2008). The initial 6.1 km section of Line 2 finally opened in early 2015. It was excavated by tunnel boring machines. Interchange with Line 1 is provided at Świętokrzyska station. All the stations have a similar design, but each with a different colour assigned. 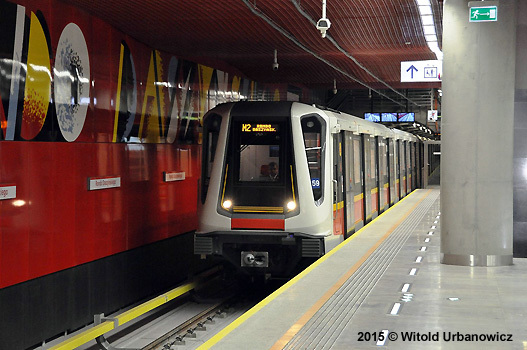 The line is operated by a fleet of 20 six-car Inspiro metro trains supplied by Siemens/Newag. 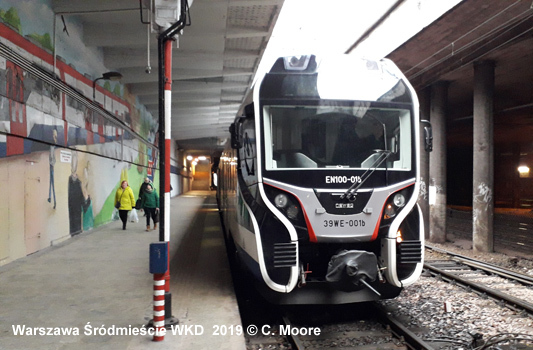 In a second stage, Line 2 will be extended with three station at each end, from Rondo Daszyńskiego west to Ksiecia Janusza (3.4 km) and from Dworzec Wileński northeast to Trocka in Targówek district (3.1 km). Both extensions will run completely underground and are due for completion in 2019. 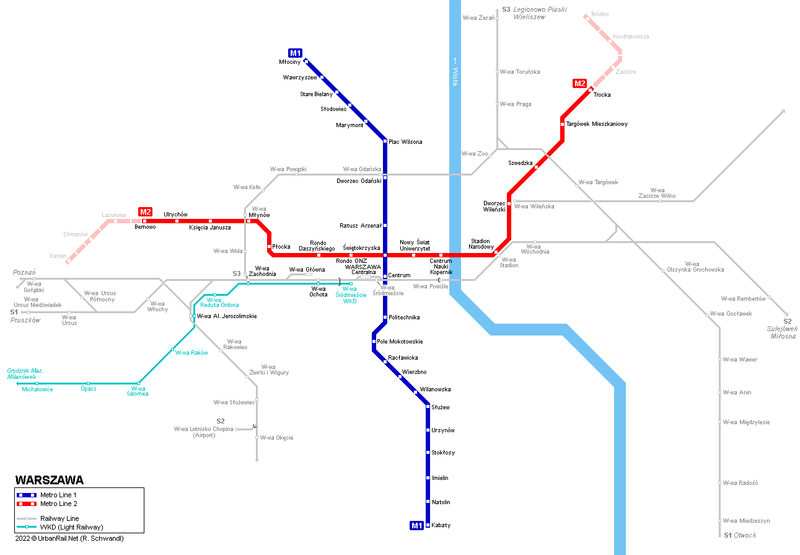 Apart from the new metro there is also a light rail line, opened in 1925, running partly in tunnel in the city centre (parallel to PKP rail tracks) and then out to the western suburbs. This was the first electrified railway line in Poland and is 33 km long. 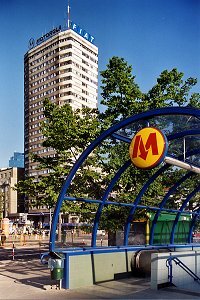 Its city terminus Śródmieście WKD is located next to the Central Railway Station. A 2 km long extension from Salomea to the airport might be built in the future (see WKD's web site). 10/2017, Text deutsch/English, ISBN 978 3 936573 50 3, EUR 19.50 - For more info & sample pages click here! Ratusz station renamed Ratusz Arsenał in Feb 2007. 2004 © UrbanRail.Net by Robert Schwandl.